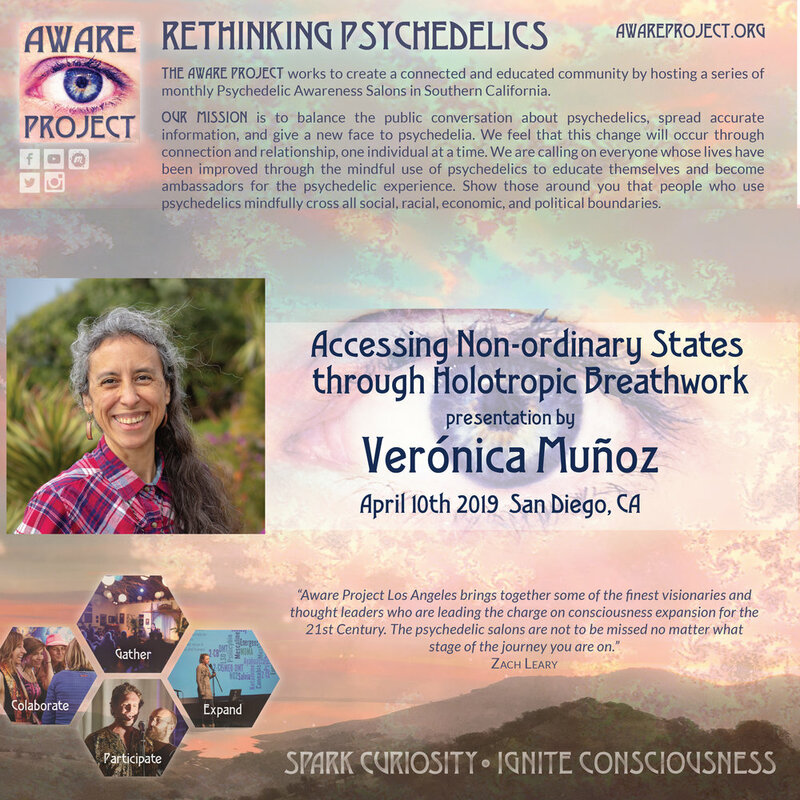 Accessing Non-ordinary States Through Holotropic Breathwork, a presentation and intro workshop by Veronica Munoz. We cannot always predict attendance and there is limited seating available so come early to ensure you get a seat! For those interested in diving deeper with an all-day full holotropic breath experience, Veronica will be facilitating a workshop on Sunday, April 28th in San Diego. The event is from 9 am to 9 pm. LOCATION: Rooted Kava Bar in Hillcrest. (Parking should be reasonable, we made sure of this!). How Holotropic Breathwork was developed as a method of entering non-ordinary states of consciousness without the use of psychedelic. The healing potential of the expanded states of consciousness and benefits of Holotropic Breathwork. Kind of experiences that are possible during a Holotropic Breathwork experience (Grof cartography of the psyche). Components of Holotropic Breathwork: breather/sitter roles, deeper and faster breathing, music, body release work, mandala drawing. Verónica Muñoz is a Holotropic Breathwork (HB) facilitator, certified by the Grof Transpersonal Training (GTT) in 2009. She has experienced HB since 1999, and has facilitated more than 180 HB sessions at workshops, retreats, and GTT training modules in USA, South America (Chile, Argentina, Colombia, Brazil) and Europe (Czech Republic, Germany, Serbia). Verónica worked in Chile for 15 years supporting human resources development as a full-time Organizational Psychologist with a Master in Business Administration. At the same time, she was actively focused in her self-exploration, experimenting with a wide range of healing modalities. With no doubt, HB has been the most powerful tool in this process. Though it, she has embraced inner healing and spiritual awareness. This experience has encouraged her to dedicate her efforts to facilitate that others embark upon their own holotropic journeys in a safe, and supportive setting. Verónica moved to USA in 2013. Currently she hosts Holotropic Breathwork workshops in San Diego, and co-facilitates at HB workshops and retreats in Seattle. Tickets are $15 presale, or $20 at the door. Friend packs are $45 (4 tickets for the price of 3). There are a limited number of Volunteer tickets available. Please contact Caitlin@awareproject.org if you wish to volunteer and attend the event for free. Refunds for personal reasons of not attending will not be issued. Refunds allowed up to 7 days of event.